Joe Bourne's Brain Dump Blog! 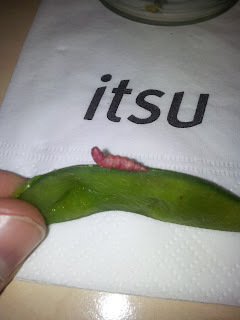 : I found a Caterpillar in my Itsu beans!! I found a Caterpillar in my Itsu beans!! I was just tucking into my Itsu edamame beans, when i suddenly felt something a bit unusual in my mouth. I took the bean out of my mouth and was shocked to see a little caterpillar sat on the side of the bean!! After close inspection, I could see a tiny hole in the side of the bean shell where the unfortunate caterpillar had crawled in, presumably intending to one day emerge as a beautiful butterfly. Unfortunately for this little guy, his new found bean house was plucked from its plant, and shipped thousands of miles across the globe to be put on sale as a tasty snack in a London branch of Itsu. Instead of emerging from the bean as a delicate butterfly, the dead lifeless body of the wiggly little creature was squeezed from the bean and was lucky not to have been chewed up along with the rest of the bean's content. Slightly alarmed by my findings, i contacted Itsu, and was told that i wasn't the first person to discover a caterpillar in my beans but it was very rare. They also explained that because they source their produce from farmers who dont use nasty chemicals or pesticides, a certain number of caterpillars were bound to slip through their quality control process, and they offered me a free lunch for my troubles. All in all, quite a strange experience, but no harm done, no caterpillars swallowed, i got offered a free lunch! Also its good to know that the food i was eating was from a natural, chemical free farm where tiny little creatures like this are still allowed to live. it certainly hasn't put me off eating Itsu beans, but i do now find my self examining them for entry holes! !